Explanation: Billions of years from now, only one of these two galaxies will remain. 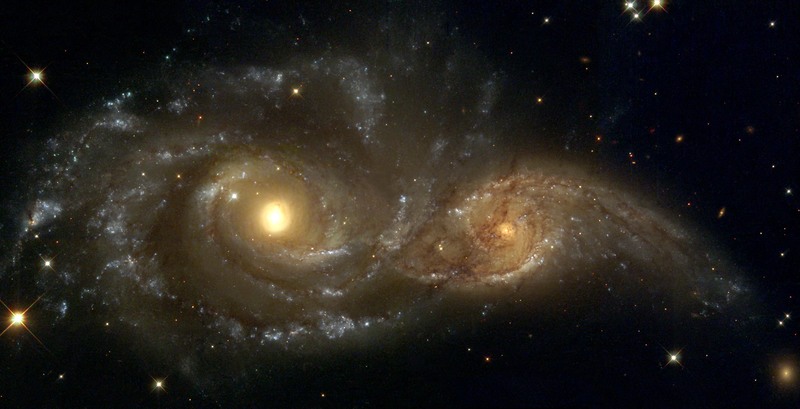 Until then, spiral galaxies NGC 2207 and IC 2163 will slowly pull each other apart, creating tides of matter, sheets of shocked gas, lanes of dark dust, bursts of star formation, and streams of cast-away stars. Astronomers predict that NGC 2207, the larger galaxy on the left, will eventually incorporate IC 2163, the smaller galaxy on the right. In the most recent encounter that about peaked 40 million years ago, the smaller galaxy is swinging around counter-clockwise, and is now slightly behind the larger galaxy. The space between stars is so vast that when galaxies collide, the stars in them usually do not collide.